Fits all Kodiak 700's 2016-present. Converts your Limited Slip Kodiak 700 Front Differential to "On-Demand" Fully Locked Four-Wheel-Drive with the flip of a lever. Get maximum traction and performance to all 4 wheels for the worst conditions. No more 3 wheel drive action. 3 Position Lever for 2wd, 4wd, and Diff Lock with Laser Etched Lettering. Harshly tested on 32 Juggernaut mud tires with 0 issues. 4wd light and display sync with the kit. The installation of our locker can be done with basic hand tools and requires no welding, cutting, or other permanent modification of existing parts on your Kodiak. The kit comes with everything you need for the install. As always, we are here to help at any time and we have a detailed video of the installation for your reference. What's in the box? Brand new AISI 4140 hardened ring carrier. Cable and laser etched lever assembly. See the Grabber Kit in Action! 501Parts "Grabber" Diff Lock Kit in Action Kodiak 700 - YouTube. Video will open in a new window. "Grabber" Diff Lock Kit Install for Yamaha Kodiak 700's - YouTube. 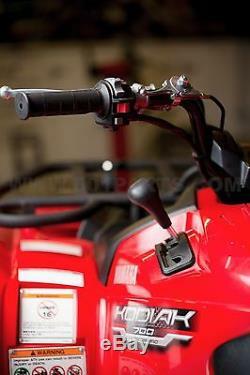 See our other Diff Lock Kits and Yamaha 4wd system related products. Thanks for looking, let us know if we can help you! We stand behind our products. The item "Grabber Full-Traction Differential Lock Conversion Kit Fits Yamaha Kodiak 700" is in sale since Wednesday, May 10, 2017. This item is in the category "eBay Motors\Parts & Accessories\ATV, Side-by-Side & UTV Parts & Accessories\Engines & Components". The seller is "501parts" and is located in Magee, Mississippi. This item can be shipped worldwide.